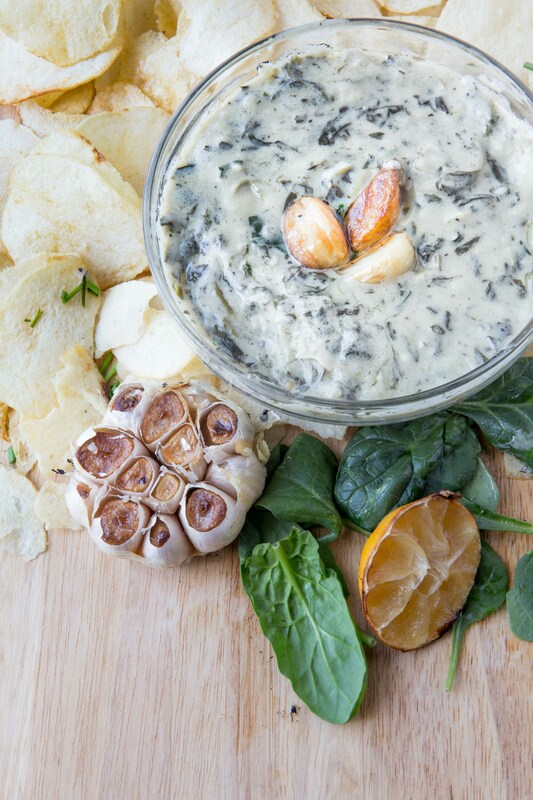 I’ve been craving chips and dip like crazy and this Dairy Free Roasted Garlic Spinach & Artichoke Dip from my friend Brittany Angell  is EXACTLY what the world needs right now. Friends! 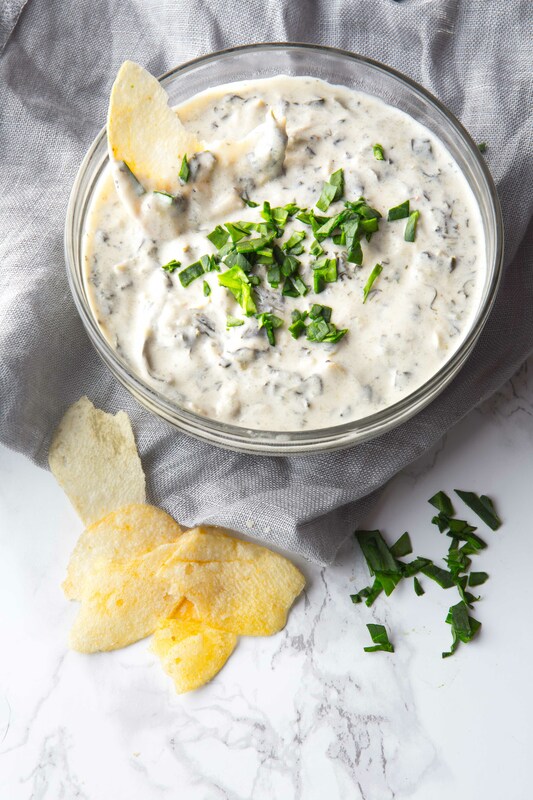 It’s been a hot minute since I had a guest post on my blog but I am so SO excited to have my friend and fellow blogger, Brittany Angell here today to share her incredible NEW Roasted Spinach and Artichoke Dip. I’m seriously about to head to the stor so I can grab the ingredients and I’m pretty sure you’ll want to also after you check it out below. And if you have not visited Brittany’s blog, you’ll want to do that too for her gifted approach to allergen friendly baked goods. You can find her HERE ! Take it away Brittany! I was diagnosed with Hashimotos disease back in 2007. For several years I had to eat a super restrictive diet while I was working to get my health issues into remission. I’ll never forget that feeling of being deprived and missing out on my favorite things. That inspired me to jump into the kitchen and spend many years mastering my baking skills using new allergen free ingredients! 11 years later and Im still at it.. recreating everyones favorite foods in a healthier way for various allergies and diets! Jennifer is one of my absolute favorite people. There are only a handful of bloggers that I know that spend the time to make sure recipes are the very best they absolutely can be and she is one of them! You can trust her recipes will work every time. I’m honored to be here today! 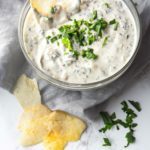 This dip is super creamy and has so much flavor. You’ll be surprised by how closely the texture and flavor mimics real cheese! Make it for the Super Bowl – just as my dairy free queso recipes  do- it will get devoured by everyone even if they are not typically Dairy Free. Just do yourself a favor and don’t use Daiya Dairy Free Cream cheese..Its really sour and well (GROSS). It will ruin this recipe. Stick with Kite Hill Cream Cheese OR Tofutti soy based cream cheese. The brand of Marinated Artichoke hearts that I purchased came in a jar and they had A LOT of flavor. They were very lemony and sour. As a result I only used about 1/2 cup of them. Give your artichokes a taste and add just a little at a time to make sure the flavor doesn’t get too strong. You can also rinse them off before putting them in the dip if you wish in which case you could add a full cup or more. Just keep in mind that is they are super lemony using a full cup will make your dip become s bit sour! If you enjoy that flavor then go for it! *Ingredient note: The magic mushroom powder can be found in Whole Foods. The recipe to make it can be found on Nom Nom Paleo’s website ! Its a really important ingredient in this recipe and plays a big role in giving you a cheesy flavor. If you don’t have a Whole Foods near you- I highly recommend making it! Its an all around great spice blend that you will love having for a wide variety of applications. 1/2– 1 cup chopped marinated artichoke hearts (to taste!) *some brands have more flavor than others..add a little at a time until you like the flavor! 1 Tsp Salt (or more or less to taste- this will depend on the saltiness of your artichoke hearts! because this will vary from brand to brand). Roast Your Garlic. Place it on a small pan at 350 and drizzle with a little oil (avocado, grapeseed or refined coconut) Bake for 18-25 minutes until perfectly golden. Place the Garlic, Blanched Almond Flour and Water in a blender and process on high for about a minute (until totally smooth and frothy). Pour into a sauce pan and add the coconut oil, Nutritional Yeast, Magic Mushroom Powder, cayenne and Starch. Turn the heat on to Medium/low and whisk until slightly thickened. Add in the spinach and turn down the heat so you only have gentle bubbling. (If this cheese gets too hot the emulsion will break! You don’t want that to happen). Stir and whisk for several minutes until the spinach is cooked through. Then add (starting with half a cup) your chopped artichoke hearts and your cream cheese. Whisk until the cream cheese has broken down. Give the dip a taste and decide if you want to add more artichoke hearts or not! Then- add salt to taste! Serve Hot or Cold. You can reheat over medium low heat in a saucepan or in the microwave- stirring it every 20-30 seconds until fully warmed. Store in a sealed container in the fridge for up to 1 week. It tastes best the day after its made so that the flavors have time to develop. *Note: Most spinach and Artichoke dips call for Mayo! Which you can absolutely add. I added 1/3 cup! If you like to eat the dip cold I think the mayo tastes amazing in it! If you like your dip hot then I think its better without the mayo. I waited until the dip cooled down before stirring in my mayo. Cold Spinach Artichoke Dip with the mayo added! When its cold- it reminds me quite a bit of that delicious spinach artichoke dip that you can buy in a jar! Copyright © 2014 Predominantly Paleo. All rights reserved.